Will AUDUSD Break 78 Cents? 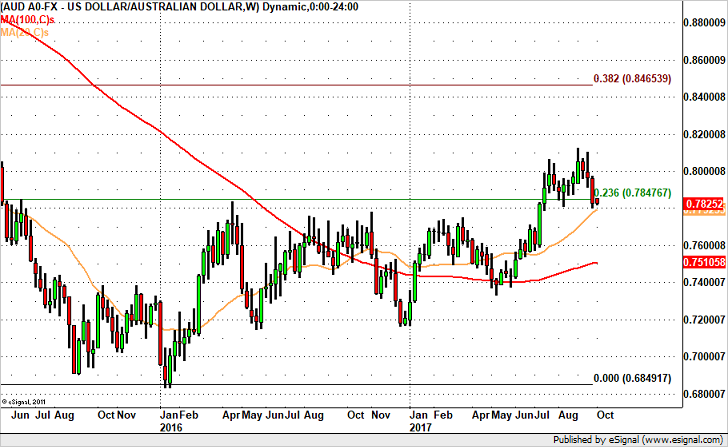 The new week will also be an important one for the Australian dollar with a Reserve Bank monetary policy announcement on the calendar along with retail sales, the trade balance and PMIs. The Australian dollar has traded lower ahead of the rate decision as investors anticipate more cautiousness from the central bank. This would be a departure from RBA Governor Lowe’s view back in September when he said lower rates would add to risk in household balance sheets, sending AUD/USD sharply higher. However data has taken a turn for the worse over the past month with consumer and business confidence falling, GDP growth slowing, inflation expectations declining and service sector activity slowing. Copper and iron ore prices have also fallen sharply and China is slowing with Standard & Poor’s recent downgrade. There’s very little for the RBA to be excited about and for this reason they could emphasize the challenges that the economy faces over the prospects for growth. If that’s the case, AUD/USD will extend its losses but if they focus on their expectations for a gradual pickup in activity and rise in inflation, AUD/USD could find its way back towards 80 cents. Technically, 78 cents is a very significant support level. Not only is there horizontal trendline support on the daily chart but the weekly chart shows the 20-period SMA and the 23.6% Fibonacci retracement of the 2011 to 2015 decline right around the same level. So if AUDUSD drops below 0.7780, we should see a much deeper correction down to 0.7650. However if it holds that level then the pair should find its way back above 79 cents.